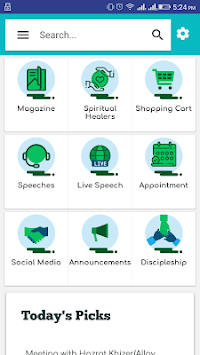 Official App of Ubqari® - International Center for Peace & Spirituality. For years, Ubqari Institute® has been known for its efforts, providing a relief to the suffering humanity and acting for the Peace and Prosperity of all, regardless of the creed, nationality and religion. 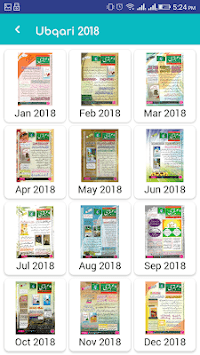 Ubqari Monthly Magazine (URDU) was initiated as a nonprofit venture to uplift the moral and ethical values of the society and eliminating adversities through Noble Quran, Sunnah and practices of the faithful. Similarly, Ubqari Laboratories® has a mission to provide authentic medicine to the patients and thus has established more than 70 famous brands at the moment. With our lifelong history of benevolence, Ubqari Trust® was launched to provide a platform to redistribute the Alms & Charity to the deserving as decreed in the Sharia (Law) of the Prophet Muhammad (SAW). Their circumstances are investigated with privacy through local representatives and then specific Alms (Zaqat) or Charity are redistributed to them. 1. Available in English and Urdu language. 2. Daily alerts of interesting articles & wazaif. 3. 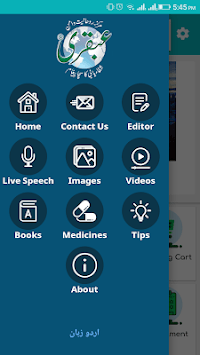 Listen to Live audio & Video speeches. 4. Font size of your choice. 5. Buy Ubqari Laboratories® medicines with cash on delivery service..
6. Listen to Live & recorded speeches of Hazrat Hakeem Muhammad Tariq Mahmood. 7. Read all editions of Ubqari Magazine® Online for free. 8. Get proven islamic wazaif for any spiritual or physical ailment. 9. All in one solution for beauty tips and kitchen remedies. 10. Interesting articles submitted by peoples around the world. 11. Important announcements by Ubqari® delivered right on your home screen. Note: This is a beta version of Ubqari App which is still undergoing final testing before its official release.